Tawas Point State Park in Iosco County is a small unit at only 183 acres and it contains a big campground, a modern facility with 193 sites and four cabins spread across three loops. That doesn’t leave much room for trails. But the park’s lone trail, while short, is a scenic and very interesting hike, especially if you are a birder. The park preserves the end of Tawas Point, a two-mile spit that separates Tawas Bay from Lake Huron. 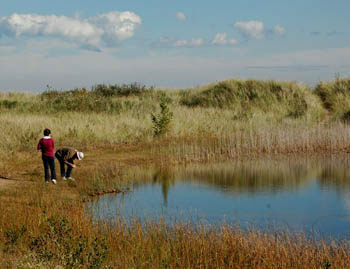 The tip of the point is a jagged hook of sandy beaches, wetlands and small dunes and it is this unique sand dune ecosystem and its location as a major landfall for birds migrating across Saginaw Bay that make Sandy Hook Nature Trail a popular destination for birders every fall and spring. Birding peaks in mid-May when for three days the park becomes the site of the Tawas Point Birding Festival (tawasbirdfest.com). During the migrations, the point is said to be "alive with birds." Often spotted along beaches or the small inland ponds are terns and gulls, including Bonaparte's gulls and Caspian terns, along with shorebirds such as red knots, whimbrels, and even the rare piping plover. The ponds also attract loons, flocks of mergansers, and a variety of other waterfowl species. The end of the spit is practically treeless, but warblers, flycatchers, and hummingbirds feed among the willow thickets and shrubs such as sand cherry. 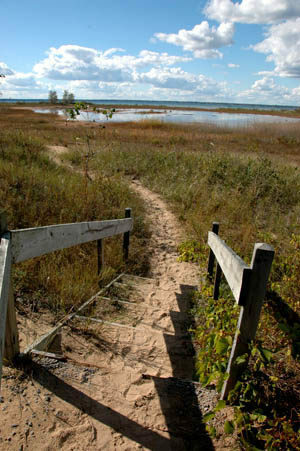 The trail is mainly a sandy path that connects a few stretches of boardwalk along the Tawas Bay and Lake Huron sides of the spit. 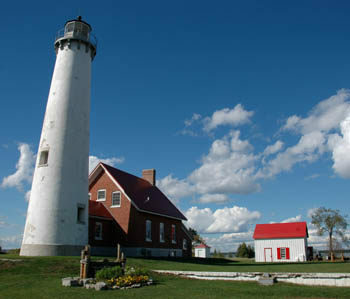 Its most obvious feature is neither birds nor beaches but the historic Tawas Point Lighthouse that can be seen from different angles throughout much of the walk. Its 19 posts and interpretive brochure have long since been replaced by a dozen plaques along the trail covering topics such as rare terns, looking for tracks and the lighthouse. The trail is closed to mountain bikes and dogs are prohibited. You can ski it in the winter but its limited mileage and sandy conditions make it unappealing to most Nordic skiers who would much rather head inland to the Corsair Trails. 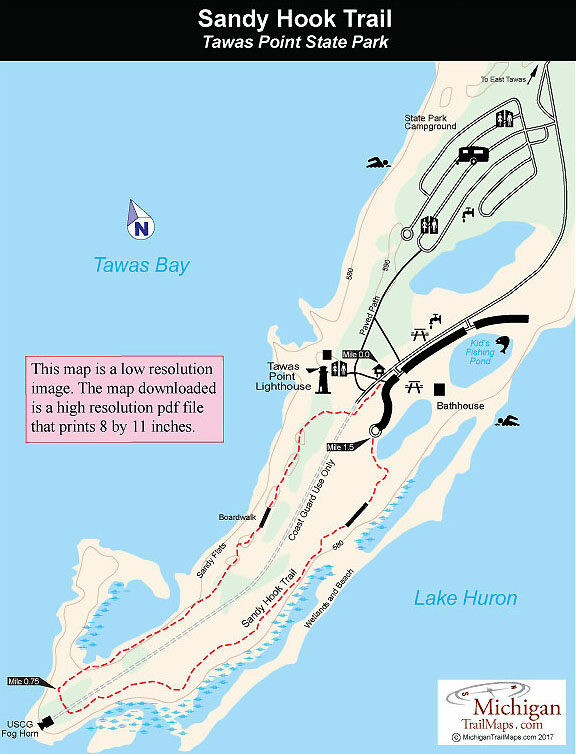 The trailhead is just off the day-use parking area and is posted along the paved path to the Tawas Point Lighthouse. The trail quickly breaks out of the pines and passes the lighthouse complex that also includes a museum store and restrooms. The original lighthouse was built in 1853 and was located east of here, towards the park headquarters. This one was constructed in 1876, and the cement cribbing at its base is testimony to the two feet of water it stood in at the time it was built. The lighthouse is now part of the park which offers a lighthouse keeper program and lighthouse tours for a small fee. Beyond the lighthouse, the trail crosses the Coast Guard Service Road (closed to the public) and enters the dune ecosystem to become a soft, sandy path along the crest of a low dune. Within a quarter mile from the parking lot you cross a boardwalk with a bench in the middle and a view of Tawas Bay. To the east you can see the spit extending out and then curving back in its hook. To the northwest is another view of the lighthouse. A little more than a century ago, most of the point was under water, but the spit of land has been built up by the long shore currents sweeping along the Lake Huron coast. The currents keep sand moving in the shallow water parallel to the shoreline, until Tawas Bay is encountered. Upon reaching the bay, the currents spread out and slow down, depositing the sand in a long, narrow peninsula. The distinctive hook at the end has been formed by advancing waves, which bend and wrap around the end of the point. The most obvious evidence of the spit growing are the older hooks, each of which at one time marked the entrance to the bay. Eventually, geologists say, Tawas Point will extend completely across the bay, turning it into a lake in much the same way Tobico Marsh was formed in Bay City State Recreation Area. You hike towards the “hook,” skirting a power line at times and then at Mile 0.75 take one last look at Tawas Bay and head south (left) to cross over to the Lake Huron. Along the way you re-cross the Coast Guard Service Road near the Fog Signal Building the USCG still maintains. Old park maps show a spur trail beginning here and heading out to the hook but it’s no longer posted. Still, it would no be hard to hike out to the end of the point in this almost treeless area. The endless blue horizon of Lake Huron is in vivid contrast to the enclosed Tawas Bay and scenery on this side is much more interesting. The grass-covered dunes offer a bit more rolling terrain while the interdunal ponds and wetlands are more extensive and scenic. At times the trail resembles an old two-track but is still very sandy and in the beginning stays close to the service road. At Mile 1 you swing closer to the beach and have an opportunity to hike out to the edge of Lake Huron without having to kick the shoes off. At Mile 1.25 the trail swings left to a viewing deck with a bench. At this point the trail remains above the beach, skirting a low dune and crossing the longest boardwalk of the loop before emerging at the east end of an interdunal pond near the day-use area. Tawas Point State Park not only features the trail and a beautiful swimming beach 300 feet wide, but also a bathhouse, picnic shelter, and 193 modern campsites with a handful overlooking Tawas Bay. The park is open year-round but the Tawas Point Lighthouse and Museum is open Memorial Day through Labor Day from 10 a.m. to 5 p.m. daily and on weekends after Labor Day through mid-October. There is a fee for vehicles entering the park and additional charges for camping overnight or a lighthouse tour. The trailhead for this loop around the spit is located at the west end of the state park's day-use parking area. The 183-acre park is 3.5 miles from East Tawas or 42 miles from the I-75 and US-23 exit near Standish (exit 188). Follow US-23 northeast of East Tawas and turn east on Tawas Point Road. Signs point the way along Tawas Point Road to the state park entrance at the end. Contact Tawas Point State Park (989-362-5041) or the Tawas Point Lighthouse (989-362-5658). To reserve a campsite contact Michigan State Park Central Reservations (800-447-2757; www.midnrreservations.com).